Following construction of a CRCP, a number of mechanisms influence development of stresses in the slab and thus the formation of cracks. During the early age, temperature and moisture fluctuations induce volume changes in the concrete that are restrained by reinforcement and base friction, leading to the development of stresses. Because concrete is weak in tension, whenever the stresses that develop are higher than the tensile strength of the concrete, transverse cracks form to relieve the stresses. Reinforcement serves to keep cracks closed as keeping the cracks tight is essential in maintaining load transfer through aggregate interlock. This, in turn, reduces pavement flexural stresses due to traffic loading. Tight cracks are also beneficial to avoid water infiltration and intrusion of incompressibles through the cracks. Subsequent drops in temperature and the effect of drying shrinkage in the concrete tend to reduce the transverse crack spacing further. Externally-induced stresses due to wheel loads, and subsequent seasonal (climatic) changes, further reduce the crack spacing over time, but at a much slower rate. Overall, it has been observed that the crack spacing decreases rapidly during the early age of the pavement, up until about one or two years. After this stage, the transverse cracking pattern remains constant until the slab reaches the end of its fatigue life. The primary early-age pavement indicators of performance on CRCP include crack spacing, crack width, and steel stress, each of which is discussed in more detail below. CRCP slab segments distribute traffic loads in the longitudinal and transverse directions. In the case of short transverse crack spacings with poor load transfer, however, the slab can act more as a beam with its longer dimension in the trans- verse direction. Significant transverse flexural stresses due to traffic loading can then develop. As a result, longitudinal cracks may subsequently form, progressing into a distress condition commonly known as a punchout. On the other hand, larger crack spacings can result in wider cracks that have lower load transfer and are more prone to spalling. Evaluation of long-term performance of CRCP reveals that CRCP with adequate subbase support, and with widened lanes or tied concrete shoulders, provided excellent long-term performance. It appears from these more recent observations that crack spacing does not appear to have as significant an impact on punchouts or other distresses as was previously believed. To minimize both of CRCP distresses, the AASHTO-86/93 Guide recommends controlling crack spacing to fall between 3.5 and 8 ft (1.1 m and 2.4 m). (1)Guide for Design of Pavement Structures (AASHTO 86/93) It has been found, however, that crack spacings of less than 2 ft (0.6 m) have performed well under good soil-support conditions. An analysis of LTPP data has shown some trend for a higher probability of punchouts when crack spacings are present less than 3 ft (1.0 m). (2)Characterization of Transverse Cracking Spatial Variability: Use of LTPP data for CRCP Design The LTPP analysis is based on a limited number of sections, however. Ultimately, control of the number of short slab segments can be achieved through adequate materials selection and the use of good design and construction practices. 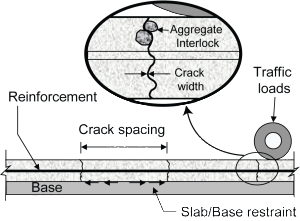 Because of variability, it is also recommended that crack spacing be characterized in terms of both its average value and its distribution. 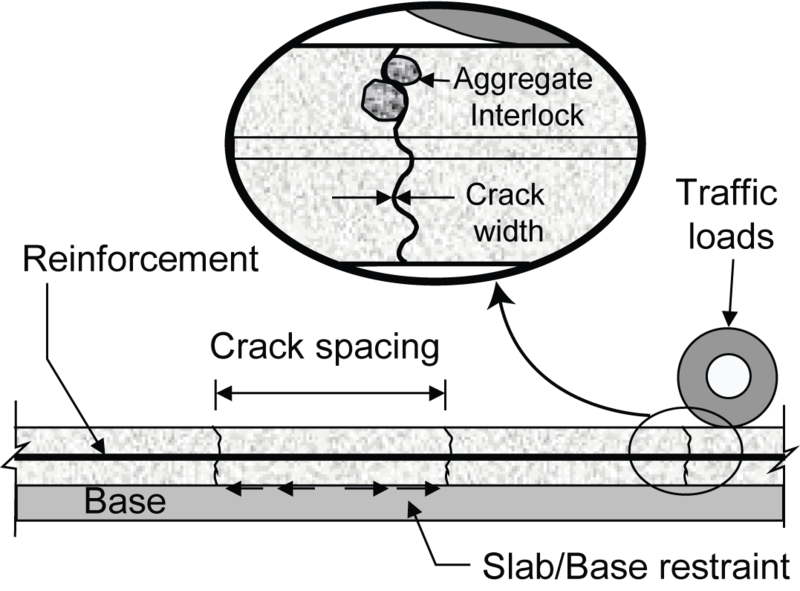 For a given crack spacing distribution, the percentage of crack spacings that fall outside the recommended range should be determined, as this may be more indicative of the potential for distress during the pavement life. Although the designer has some control over the crack patterns through the selection of the quantity of reinforcement, there are confounding factors cannot be as readily controlled during the design stage. These include the selection of materials, climatic conditions, and construction practices. It is therefore important that the highway agency ensure that the assumptions made during design are adhered to during the materials selection and construction process. This can be accomplished through use of targeted specifications or special provisions. Finally, it should be noted that with respect to crack spacing, cluster cracking and Y-cracking are a unique case of short crack spacing that can be problematic in terms of their contribution to localized failures including punchouts. These types of cracking are generally more construction related, however, and not as much a design issue. They are often caused by localized weak support or because of inadequate concrete consolidation. Crack widths have a crucial effect on CRCP performance in several ways. Excessive crack widths may lead to undesirable conditions such as infiltration of water that could later result in corrosion of the reinforcing steel and softening of the support layers. Incompressibles can also enter into wide cracks, and since the pavement is subjected to contraction and expansion as well as traffic loading, this can in turn lead to excessive bearing stresses at the cracks. If unchecked, these stresses can cause crack spalling. Furthermore, wider cracks mean that less contact exists between the faces of the crack, resulting in poor aggregate interlock. The consequence of this is an increase in slab deflections and flexural stresses that, in turn, lead to additional spalling, faulting, secondary cracking, and punchouts. The AASHTO-86/93 Guide recommends limiting the crack width to 0.04 in. (1 mm) at the pavement surface to avoid spalling. 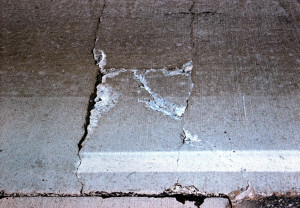 (3)Guide for Design of Pavement Structures (AASHTO 86/93) However, a crack width of 0.024 in. (0.6 mm) or less has been found to be effective in reducing water penetration, thus minimizing corrosion of the steel and maintaining a high load transfer efficiency. (4)Design of CRCP for Highways (NCHRP Project 1-15)(5)Evaluation of the Performance of Texas Pavements Made with Different Coarse Aggregates (TX-01/7-3925-1) As is done to control crack spacing, the designer may select a reinforcement percentage that achieves a desired crack width. However, it is ideal if the highway agency further ensure that assumptions made in design are adopted during construction. In general, a higher percentage of longitudinal steel leads to smaller crack widths. The results of field performance evaluations have found that an adequate amount of longitudinal steel in the range of 0.6% to 0.85% effectively keeps crack widths reasonably tight throughout the pavement life. The depth of the reinforcement is another important factor in controlling crack width. Major experiments in Illinois show that when reinforcement is placed above mid-depth, the cracks are more narrow leading to fewer punchouts and repairs over the long term. For reasons of adequate cover, reinforcement should not be placed closer than approximately 3.5 to 4 in. (89 to 101 mm) from the surface of the CRCP. The level of stress that develop in both the concrete and reinforcement will also influence CRCP performance in the long term; the reinforcement serves to restrain volume changes in the concrete, keeping cracks tight. Consequently, significant stresses develop in the reinforcement at the crack locations. Reinforcement design has to consider possible fracture and/or excessive plastic deformation at these locations. Excessive yield or fracture of the reinforcement may lead to wide cracks, corrosion, and loss of load transfer that may later result in undesirable distress. It is common for a limiting stress criterion to be used for reinforcement design. This is often selected as a fixed percentage of the ultimate tensile strength, thus avoiding fracture, and allowing only a small probability of plastic deformation. 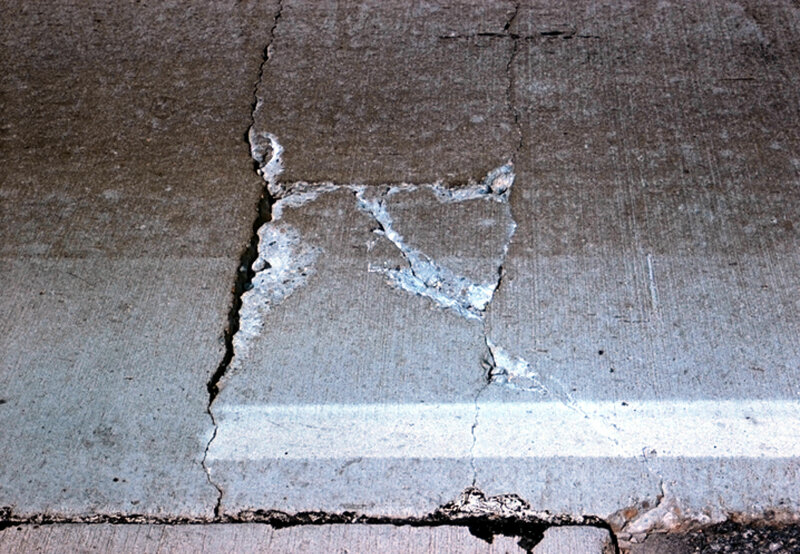 (6)Guide for Design of Pavement Structures (AASHTO 86/93)(7)Limiting Criteria for the Design of CRCP (FHWA/TX-79/21+177-17) It should be recognized in design that slightly wider crack openings may result when permanent deformation is allowed to occur.